MANILA – Martial law victims on Thursday trooped to the Aquino residence in Times Street, Quezon City to remind Pres. Aquino that it was not just former Sen. Benigno Aquino, his late father, who fought the former dictator. Protesters led by the group SELDA urging the people not to allow the resurrection of dictatorship. Photograph by Krisken Jones. 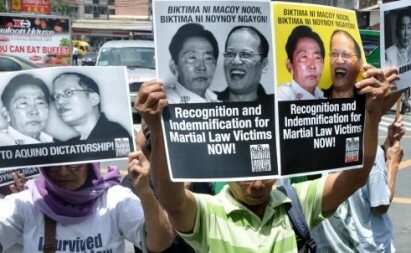 The Martial Law era activists renewed their call: No to dictatorship! Never again to martial law! They chanted slogans like “We ousted a dictator before. We can do it again!” and expressed their resolve not to allow the resurrection of the dark days of martial law. “The people opposed the Marcos regime long before the late Sen. Ninoy Aquino was assasinated, and long before martial law was declared,” affirmed Marie Hilao-Enriquez, a staunch activist and political prisoner during martial law. “We should remain vigilant and defiant to any sitting President who pretends to be ‘pro-people, pro-democracy and patriotic’,” Enriquez said. The country has not seen significant change from the time of former dictator Marcos up to Noynoy Aquino’s administration, remaining under the shackles of corruption, subservience to U.S. policies and state repression, she added. “And now, Noynoy Aquino wants to perpetuate himself in power by amending the Philippine Constitution and clipping the powers of the judiciary … His regime is set on further selling out the national patrimony. Noynoy Aquino is doing a Marcos,” Enriquez asserted.